Also called the Muscogee, the Creek were made up of several separate tribes that occupied Georgia and Alabama in the American Colonial Period. Their confederacy, which formed the largest division of the Muscogean family, included other Muscogean tribes such as the Catawba, Iroquois, and Shawnee, as well as the Cherokee. Together, they were sufficiently numerous and powerful to resist attacks from the northern tribes. They received their name form the English on account of the numerous streams in their territory. It is believed that the Creek culture began as a way to guard against other larger conquering Indian tribes of the region. One of the Five Civilized Tribes, they formed the Creek Confederacy with other Muscogean speaking tribes, the Alabama, Hitchiti, and Coushatta. The Creek Confederacy was in constant flux, its numbers and land possessions ever-changing as small bands joined and withdrew from the alliance. Society was organized in matrilineal, exogamous clans, each bearing the name of its totem animal. The economy centered upon agriculture, growing corn, beans, squash, pumpkins, melons, and sweet potatoes. When war erupted in 1813 between the United States and the Red Stick faction of the Creek Nation, a series of raids were launched against the white settlements. These raids culminated in the sacking of Fort Mims, in which 400 settlers were killed. General Andrew Jackson defeated the Red Sticks at Horseshoe Bend, and exacted a disastrous cession of 23 million acres of land from the Creek tribe. When Jackson became president, he forcibly removed the Creek to what is now Oklahoma. Today, the Creek Confederation has its capital in Okmulgee, Oklahoma; but there are a few surviving bands in Alabama, Georgia, and Florida. Nothing certain can be said of their previous condition, or of the time when the confederacy was established, but it appears from the narratives of Spanish explorer, Hernando de Soto’s expedition that leagues among several of these towns existed in 1540, over which, head chiefs presided. For more than a century before their removal to the west, between 1836 and 1840, the people of the Creek Confederacy occupied some 50 towns, in which were spoken six distinct languages — Muscogee, Hittite, Koasati, Yuchi, Natchez, and Shawnee. The first three were of Muscogean stock. About half the confederacy spoke the Muscogean language, which thus constituted the ruling language and gave name to the confederacy. The meaning of the word is unknown. Although an attempt has been made to connect it with the Algonquian, the probabilities seem to favor a southern origin. The people speaking the cognate Hitchiti and Koasati were contemptuously designated as “Stincards” by the dominant Muscogee. The Koasati seem to have included the ancient Alibamu of central Alabama, while the Hitchiti, on lower Chattahoochee River, appear to have been the remnant of the ancient people of southeast Georgia, and claimed to be of more ancient occupancy than the Muscogee. Geographically the towns were grouped as Upper Creek, on the Coosa and Tallapoosa Rivers in Alabama, and Lower Creek, on middle or lower Chattahoochee River, on the Alabama-Georgia border. While the Seminole were still a small body confined to the extreme north of Florida, they were frequently spoken of as Lower Creeks. To the Cherokee, the Upper Creeks were known as Ani-Kusa use, from their ancient town of Kusa, or Coosa, while the Lower Creeks were called Ani-Kawita, from, their principal town Kawita, or Coweta. The earlier Seminole emigrants were chiefly from, the Lower Creek towns. The history of the Creek begins with the appearance of De Soto’s array in their country in 1540. Spanish conquistador, Tristan de Luna came in contact with part of the group in 1559, but the only important fact that can be drawn from the record is the deplorable condition into which the people of the sections penetrated by the Spaniards had been brought by their visit. Another Spanish explorer, Juan del Pardo, passed through their country in 1567, but Juan de la Vandera, the chronicler of his expedition, has left little more than a list of unidentifiable names. The Creek came prominently into history as allies of the English in the Apalachee Wars of 1703-08, and from that period continued almost uniformly as treaty allies of the South Carolina and Georgia colonies, while hostile to the Spaniards of Florida. The only serious revolt of the Creek against the Americans took place in 1813-14, in the well-known Creek war, in which General Andrew Jackson took a prominent part. This ended in the complete defeat of the Indians and the submission of Weatherford, their leader, followed by the cession of the greater part of their lands to the United States. The extended and bloody Seminole War in Florida, from 1835-1843, secured permanent peace with the southern tribes. The removal of the larger part of the Creek and Seminole people and their black slaves to the lands assigned them in Indian Territory took place between 1836 and 1840. The Creek woman was short in stature but well formed, while the warrior, was generally larger than the Europeans, often above six feet in height, said to have been erect in his carriage, and graceful in every movement. They were described as proud, haughty, and arrogant; brave and valiant in war. As a people, they were more than usually devoted to decoration and ornament, were fond of music, and ball play was their most important game. Marriage outside the clan was the rule, adultery by the wife was punished by the relatives of the husband, and descent was in the female line. In government it was a general rule that where one or more clans occupied a town they constituted a tribe under an elected chief, or miko, who was advised by the council of the town in all important matters, while the council appointed the “great warrior” or tustenuggi-hlako. They usually buried their dead in a square pit under the bed where the deceased lay in his house. Certain towns were consecrated to peace ceremonies and were known as “white towns,” while others set apart for war ceremonials were designated as “red towns.” They had several orders of chiefly rank. Their great religious ceremony was the annual puskita, of which ,the lighting of the new fire and the drinking of the black drink were important accompaniments. The early statistics of Creek population are based on mere estimates. In the last quarter of the 18th century the Creek population may have been about 20,000, occupying from 40 to 60 towns. Estimates made after the removal to Indian Territory placed the population between 15,000 and 20,000. After being forceably removed to Indian Territory, most of the Lower Muscogee located farms on the Arkansas and Verdigris Rivers. 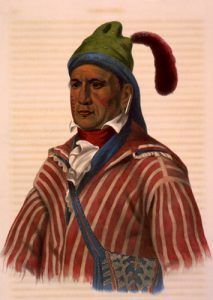 The Upper Muscogee re-established their farms and towns on the Canadian River and its northern branches. The Civil War was disastrous for the Muscogee people, even though the majority of the tribe desire neutrality. 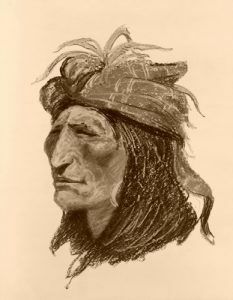 The first three battles of the war in Indian Territory occurred when Confederate forces attacked a large of neutral band led by Opothle Yahola. Eventually, hundreds of Muscogee men fought on both the Union and Confederate sides. After the war ended, the reconstruction treaty of 1866 required the cession of approximately half of the Muscogee land — some 3.2 million acres.